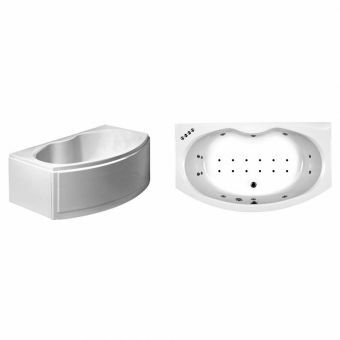 If there were a single bathroom item that spoke of luxury, comfort and perhaps just a touch of exrtavagance, it would be the Whirlpool bath tub. 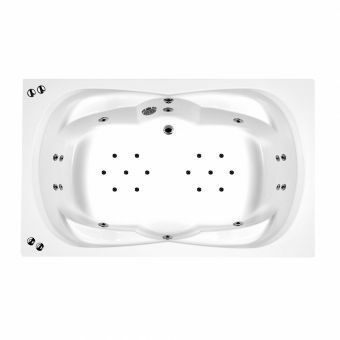 Bringing the rare treat of the spa Whirlpool into your home to be enjoyed as and when you want is readily achievable, and at surprisingly affordable prices. The bath that can massage you with jets, whirpool or airpool functions is a bath that actively rejuvenates you as you bathe. Skilfully designed to ensure that each jet and whirlpool unit is angled at the correct degree, we have selected the manufacturers and models that perform to the highest specifications. Many of our bath tubs come in standard and multiple upgraded whirpool system formats, allowing you to select which features you want according to your requirements and budget. 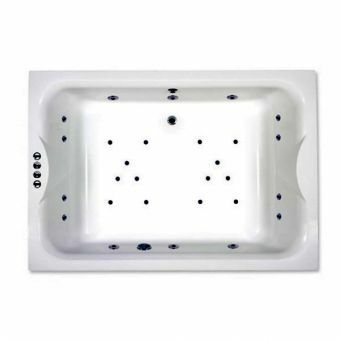 Supplied in a variety of shapes and designs, a luxury jacuzzi bath can be implemented in almost any inerior space. Corner units, inset rounded baths, freestanding units and spacious double ended baths big enough for two are all here. For years the Whirlpool bath has been considered exclusive to the domain of the wealthy, but an increase in demand and improvements in technology have lowered the cost to more accessible price points. For a few hundred pounds more than your average bath tub price, you can enjoy that spa pampering in the privacy of your own home. Easy to install and maintain, Whirlpool baths are closer in reach than ever before. A Jacuzzi bath is a touch of luxury for your home – something in which you could enjoy precious ‘me’ time, or something to make bath time fun for your children. A warm water jet massage from a whirlpool bath offers great health benefits, and increased mental wellbeing. A whirlpool bath will stimulate circulation, relieve tension, massage skin tissues to help keep them supple and looking youthful, help to reduce stress and promote a good night’s sleep. The thought of easing yourself into the bubbling water is a tempting one, but buying the right whirlpool bath for your home should, first and foremost, be a practical decision. How will you be using your new bath? 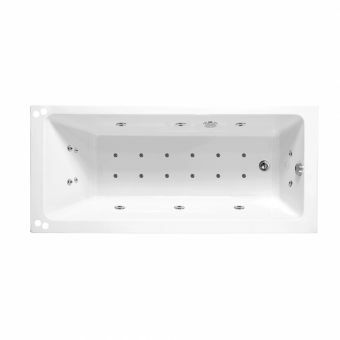 If your Whirlpool bath is all about family bath time for the children, think about one of the larger baths like the Phoenix Rectangularo 7. It's 1800mm long, 1000mm wide and 430mm deep, with a capacity of 290 litres of water, perfect for bath time for families with small children who bathe at the same time. It also has underwater lighting for even more enjoyment, and an inline heater. It is made from acrylic, the reinforced version is named: Amanzonite, a durable carbon fibre underbody which will stand the test of time. You could also look at a Phoenix asymmetric duo– 1700mm long, 800mm wide, and 420mmm deep – which is available in a range of attractive colours and with Vivo or Vivo Turbo whirlpool options. 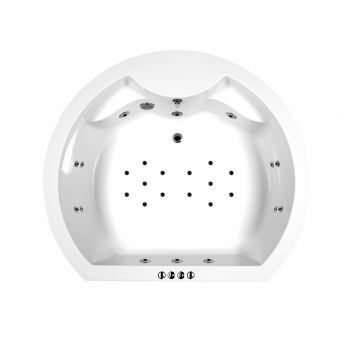 If you want to relieve your aches and pains, or just ease away the stresses of the day, check out the Phoenix Marino, a double-ended Amanzonite bath - it’s your own personal spa in your bathroom! This unit is 1950mm long, 1350mm wide, and 480mm deep and has a capacity of 460 litres; that means plenty of room to stretch out your limbs. 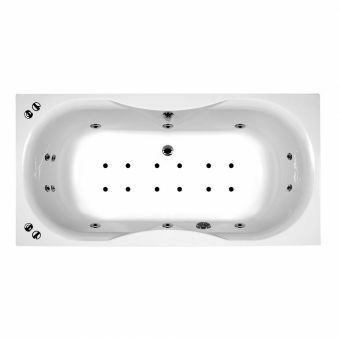 It also has directional jets and foot and back jets for the ultimate in bath-time relaxation. What will fit in your home? Measure your spaces carefully, especially if you’re renovating your bathroom and taking down walls. Don’t forget to allow for any extra space needed for items like bath stands and access panels. It’s important to decide early on if you’ll need a double-ended bath, or if your whirlpool bath will just require one end to fit in your space. Do you have a rectangular space in your bathroom which would be suitable for a standard-sized Jacuzzi bath, or do you have to contend with awkward shapes? Are you short on space? For smaller rooms, you could look at the luxury Phoenix Salerno, an inset bath. 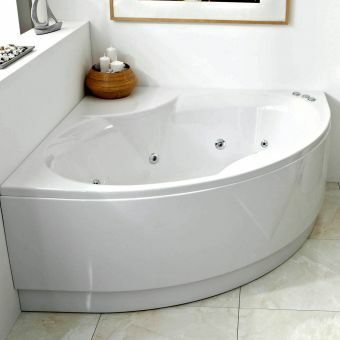 Made from smooth acrylic, this rounded bath gives you flexibility in your interior design. It is 1650mm long by 1430mm wide and 460mm deep, and has a capacity of 405 litres. The Phoenix Salerno comes with a choice of three whirlpool and airpool systems and its optional extras include an inline heater and stunning underwater coloured lighting. Read more about the Phoenix Salerno here. Would a smaller corner bath be a better option for your room? 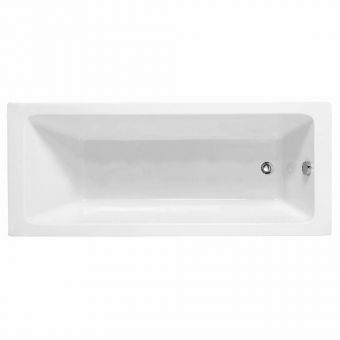 Take a look at the bow-fronted Phoenix Duo, a corner bath which is available in right or left-handed configurations It is 1540mm long, 960mm wide and 41mm deep, and has a capacity of 185 litres. Need something to bring a designer look to even the tightest of spaces? Look at Villeroy & Boch’s Subway corner bath. It’s just 1,300mm long by 1,300mm wide and 610mm deep and compatible for whirlpool technology [. Will your new bath fit through the door? Not only will you need to check the basic dimensions of your doorway and the bath, you should also check whether it will need to be turned so it can be fitted, and whether you have enough space in your room to do that. 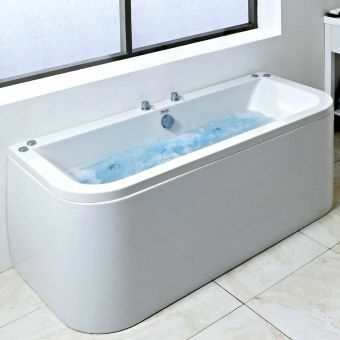 Could you re-think other bathroom elements to fit a larger Whirlpool bath? Are you making the best use of your space at the moment, or are there areas of wasted space in your bathroom? If so, you could send us some sketches of your space for advice. You may be able to move some items, or reduce their size, to help free up space for the larger whirlpool bath you’d love. For those with bags of space, Villeroy & Boch have a 2000mm long by 1300mm wide Colorado bath which is perfect for a whirlpool system – with the control postitioned on the tap ledge. 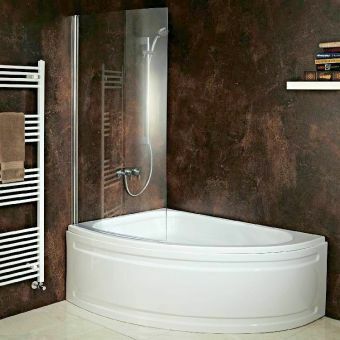 It also has the Subway oval bath at 1900mm long by 900mm wide. The whirlpool systems available include a choice between air and water nozzles. What’s the difference? Whirlpool systems push water through jets into your bath, while airpool systems push air through instead to form the bubbles. It’s all about your personal taste. Do you want more power in your system to work your muscles in the bath? Choose whirlpool. Do you want a more relaxing and gentle experience? Choose airpool. Maintenance is generally simple with both options. Ensure you never run the whirlpool jets when the bath is empty. To clean, add a gentle cleaning solution to the water, empty and fill with clean water, then run the jets again. Airpool systems are self-cleaning and self-drying. Just turn on the jets after you’ve had your bath. 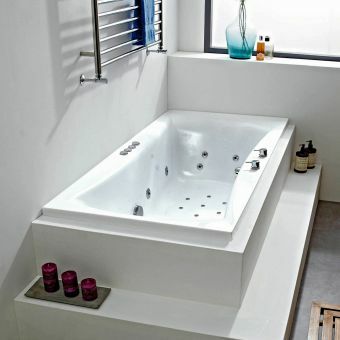 What sort of acrylic bath should you choose? Acrylic can be moulded into any shape, so it’s a versatile option for creative and contemporary bathroom designs. It’s light, which is a boon for older homes where weights have to be carefully measured for baths in first floor bathrooms, for example. It’s also easy to clean, and is smooth yet non-slip. 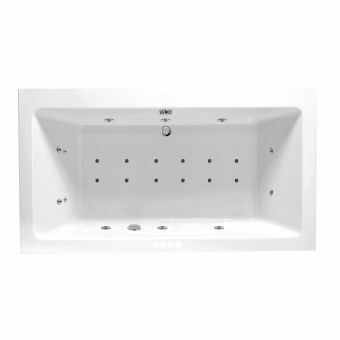 Adamsez has a range of whirlpool bath options in acrylic. The Adamsez 18 has excellent shoulder room for extra comfort. Phoenix use acrylic, the reinforced versions are named Amanzonite – it’s long-lasting, rigid, heat-retaining, and comes with a 25-year guarantee. 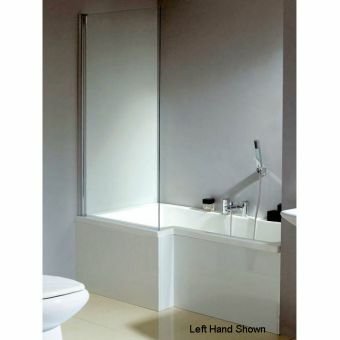 Carron Bathrooms has developed its own rigid and durable form of acrylic, carronite. It is triple-layered and reinforced and comes with a 30-year guarantee. 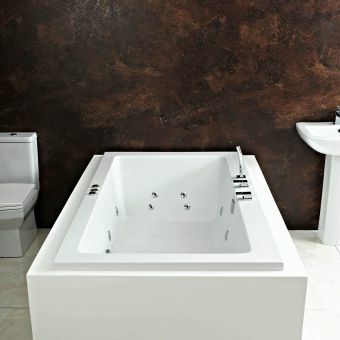 It has the Axis, a bath with a simple, sleek look in carronite. Quaryl is exclusive to Villeroy & Boch – they say it is a material which is as robust as quartz but retains the flexibility of acrylic. It’s durable and is sound-insulating. Villeroy & Boch has an 1800mm long by 800mm wide rectangular bath in the My Art collection created in Quaryl which is perfect for a whirlpool system. It’s important that you set your budget for your bath to complement the budget for any bathroom make-over as a whole. If you’re simply installing a new bath, you’ll need to factor in installation, any new tiling needed, and any extra plumbing or wiring costs. It’s worth getting your plumber or electrician to check the status of your wiring and plumbing before you start – now might be the perfect time to nip potential problems in the bud. There is a whirlpool bath for every pocket. For those on a budget, the Phoenix Rectangularo 1, which is 1700mm long and 700mm wide is easy on the bank account. A perfect option for a mid-range project might be the Phoenix Corsica bow-fronted bath, which is 1,700 long, 970mm wide and 430mm deep and has a capacity of 275 litres of water. It comes with three different whirlpool system options and also comes with a 25-year warranty. For those with a larger budget, there is the Phoenix Marino Amanzonite double-ended bath with three whirlpool options. It is 1950mm long, 1350mm wide and 480mm deep with a capacity of 4060 litres. What extras will you need? From inline heaters to underwater coloured lights, there are add-ons which will enhance your bathing experience and make your bathroom a real sanctuary. From traditional to sleek and modern, there are Jacuzzi baths for all styles of home. Carron Bathrooms’ Quantum SE comes in nine sizes and is a simple, sharp rectangular bath which would be perfect in a contemporary design or a bathroom inspired by Art Deco. The curves of the Status are reminiscent of Sixties home styles – perfect for injecting some period energy into a 1960s home. 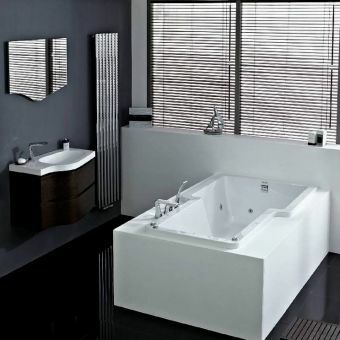 Villeroy & Boch’s Legato rectangular bath is also inspired by the sharp lines of Art Deco, but would also be an ideal Whirlpool bath in a loft apartment with a modernist scheme. It’s a versatile option for those who are updating an older home but don’t want to install traditional bathroom fittings. Looking for something unusual? Villeroy & Boch’s Loop & Friends hexagonal bath is suitable for a whirlpool system and would made an eye-catching statement in any bathroom. Our experienced staff are experts who can help you through all the decisions you have to make to get the perfect fit for your dream bathroom. We've been in business for 20 years and supplied our products to more than 30,000 households. We’ll get you the best deal possible – we pride ourselves on our industry-leading prices and excellent customer service. 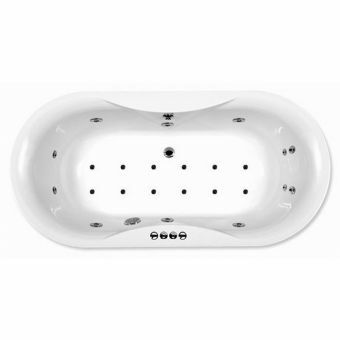 We supply Phoenix whirlpool baths along with baths from the other manufacturers mentioned on this page as a special request. Call us today on 01765 694720 for a no-obligation chat. 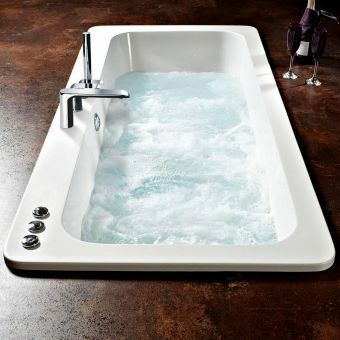 Isn’t it time you started enjoying the relaxing benefits of a whirlpool bath?